There was a time when tofu got very misunderstood. I think we've all heard it called flavourless or something that vegans only would enjoy. It took some time but but tofu finally got the praise it deserves. So how do you cook tofu that turns out golden brown and full of flavour? I find marinating it in sesame oil, tamari, miso, garlic and ginger, a marinade that I often use at home, makes for a simple, yet delicious way to get it going. Usually, I roast it with vegetables, especially with eggplant, zucchini and asparagus then serve it over quinoa, farro or zucchini noodles. 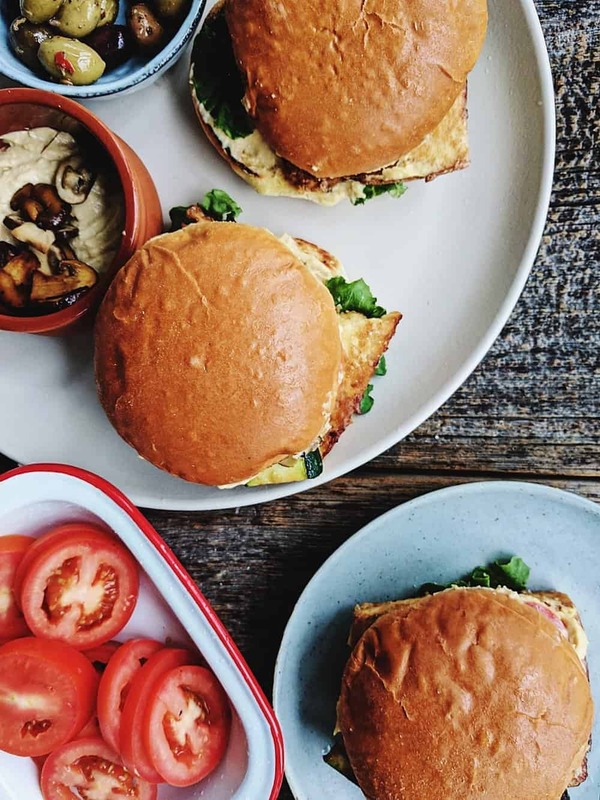 Comes summertime, for a weeknight meal, these tofu burgers come to the rescue. There was a time when tofu got very misunderstood. I think we’ve all heard it called flavourless or something that only vegans would enjoy. It took some time but but tofu finally got the praise it deserves. So how do you cook tofu that turns out golden brown and full of flavour? I find marinating it in sesame oil, tamari, miso, garlic and ginger, a marinade that I often use at home, makes for a simple, yet delicious way to get it going. Usually, I roast it with vegetables, especially with eggplant, zucchini and asparagus then serve it over quinoa, farro or zucchini noodles. 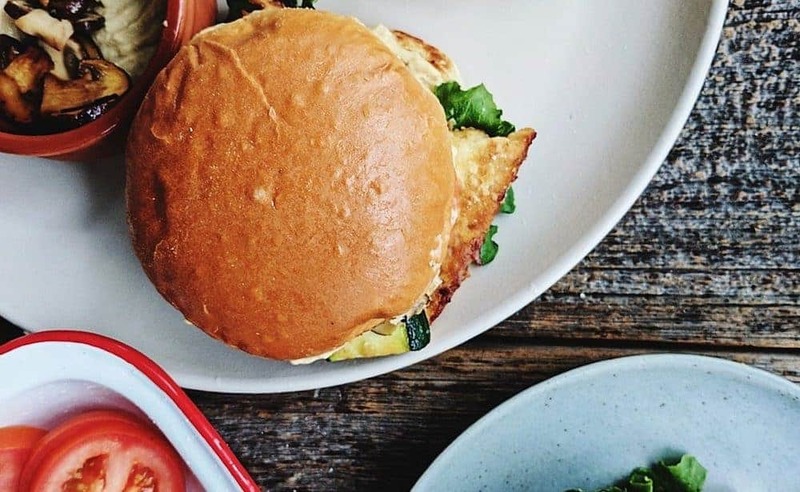 Comes summertime, for a weeknight meal, these tofu burgers come to the rescue. Now more than ever since Isabella became vegan, making more plant based meals has become a regular routine at our home. 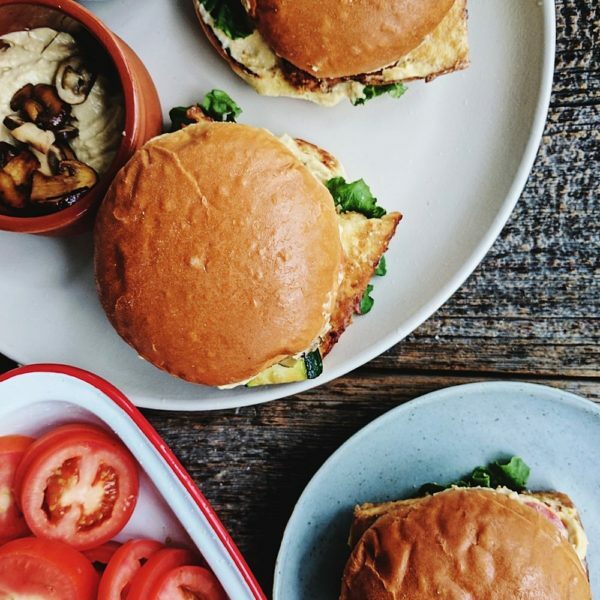 To get you ready for these tofu burgers, make sure you remove the excess water by wrapping it in a dish towel, placing it on a banking sheet and topping it with a heavy object for about 5 to 7 minutes (I use a cast iron pan). This ensures that all water comes out, the tofu absorbs the marinade better and once in the oven, browns evenly. 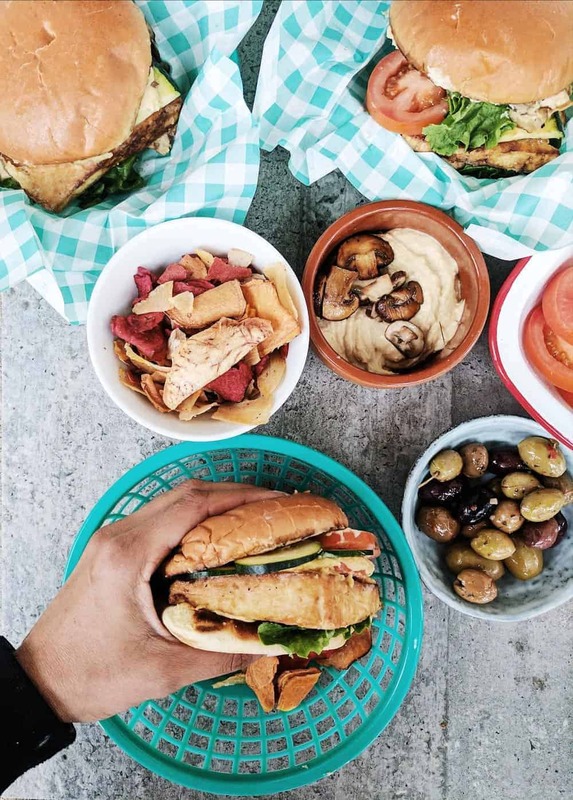 Served in the softest brioche bun, with hummus, zucchini and mushrooms, these tofu burgers will have you set for meatless Monday! Preheat oven at 375 F and line a baking sheet with parchment paper. Cut tofu into rectangles, 1 1/2 inches thick, remove execs liquid and marinate for 15 minutes in sesame oil, soy sauce, ginger and garlic. Place cornstarch and sesame seeds in a shallow bowl. Dredge tofu slices in the mixture, covering each one well and shaking off the excess. Place tofu on the lined baking sheet and bake for 20 minutes turning once at the 10 minute mark. In a skillet with olive oil set at medium heat, sautè the mushrooms and zucchini for 2 to 3 minutes adding a dash of soy sauce at the end. Once the tofu is ready, toast the buns on a grill pan and top each side with hummus. Add tofu, mushrooms, zucchini, onions and lettuce. 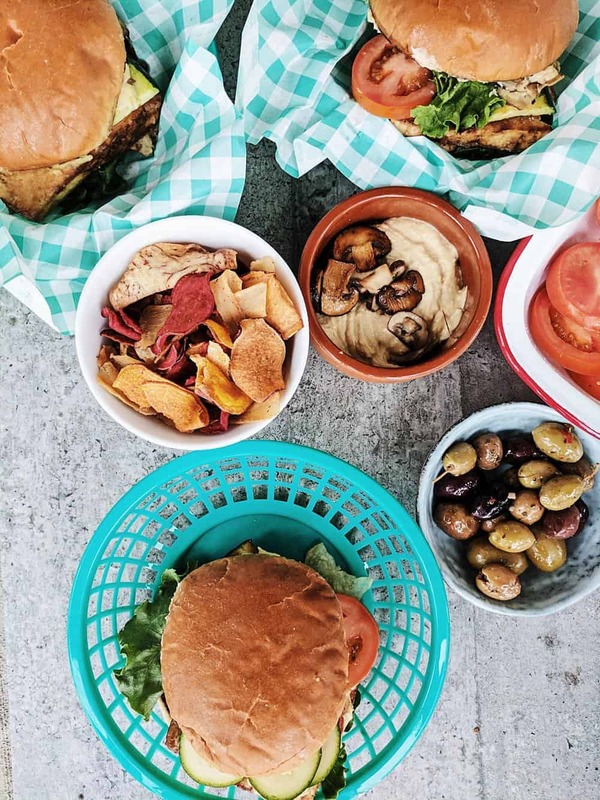 This post was made in collaboration with Weston bakeries and their 150 buns of summer, however all views, opinions and recipe development are my own. Previous Article Previous post: Google Home. Like a kid with a new toy.